Even an underdog has its day. When I heard that Rocky was being made into a musical, I will admit I was skeptical at the prospect – yet another movie franchise to be adapted to the stage in order to bring in a wider audience, one who would not normally attend a Broadway musical [namely straight men, who stereotypically are the ones dragged to such events by their wives/girlfriends or perhaps by other women in their lives]; a sign of how Hollywood is “invading” Broadway, as the trend of movies being adapted into musicals continues. While the film was great (its many sequels, however, were not as good, in my opinion), I wasn’t sure how well it would translate as a musical, the titular character not known for being loquacious, and while there have been plays about boxing and boxers, a singing boxer didn’t sound appealing to me, but then again, I’m not exactly the target audience for a show of this kind. 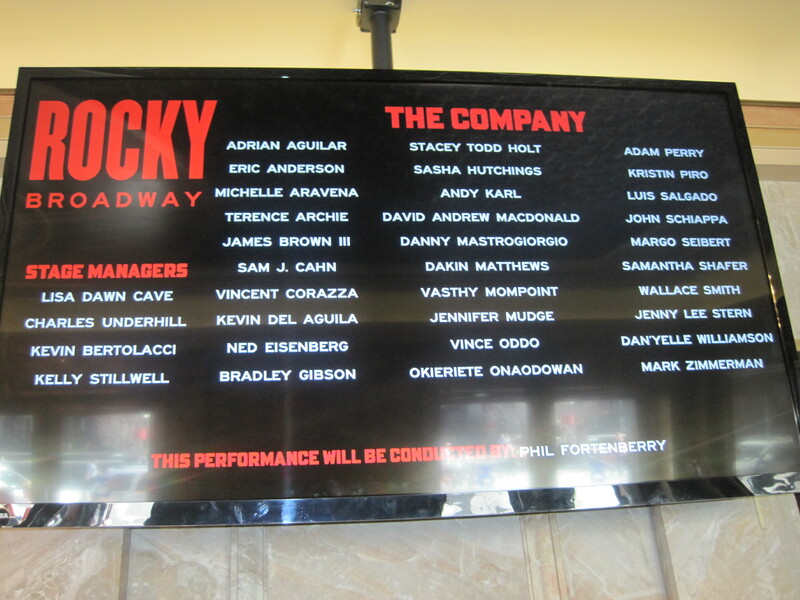 While hanging out with some friends (and ardent theatergoers) we decided on a whim to see Rocky, if only out of curiosity, as the show had gotten rave critical reviews (and there weren’t any other shows listed on TKTS we were super anxious to see that we hadn’t already seen before). I knew the score was by Stephen Flaherty, and lyrics by Lynn Ahrens (the same writing team as Ragtime, Once on This Island, and many others), so the odds were hopeful that the score would be great, but I was still wary of how the show would unfold. Well, having said all that, I must recant those cynical thoughts, as I was pleasantly surprised at how much I enjoyed the show, and how invested I became in the characters and in the story. 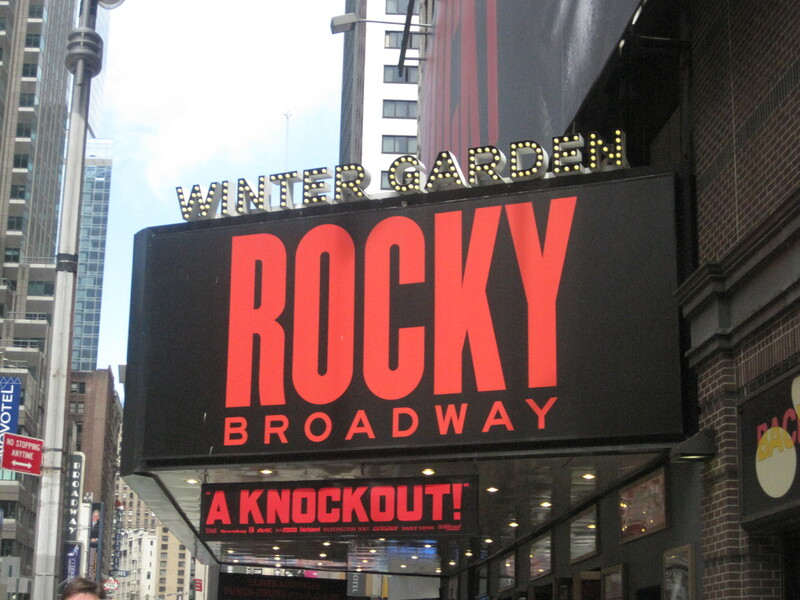 As in the film, the musical follows the life of boxer Rocky Balboa, as he is offered the opportunity to fight reining (undefeated) champion Apollo Creed in a title bout; concurrent with Rocky’s training, he attempts to woo Adrian, a seemingly timid young woman (and sister of one of his friends), with eventual success. Everything about the show is amazing – from the set design, lighting and use of projections to simulate the streets of Philadelphia circa 1975, to the moment where the theater transformed into a sports arena for the title bout, at which point, those sitting in the first ten or so rows in the center orchestra are asked to rise to be seated on the bleachers seats on stage, as the boxing ring moved out over those rows towards the audience, with monitors descending above the ring simulating an arena jumbo-tron. The fifteen-round fight, time-lapsed with the use of strobe lights, was thrilling to watch, as audience members rose to their feet, cheering as if they were at an actual boxing match. All the iconic elements from the film were present, from Rocky punching slabs of meat, his running up the steps during his training to the interweaving of the Rocky theme into the original score and inclusion of “Eye of the Tiger”. The score itself captured the essence of the show, with a fine balance between touching ballads and rousing anthems. 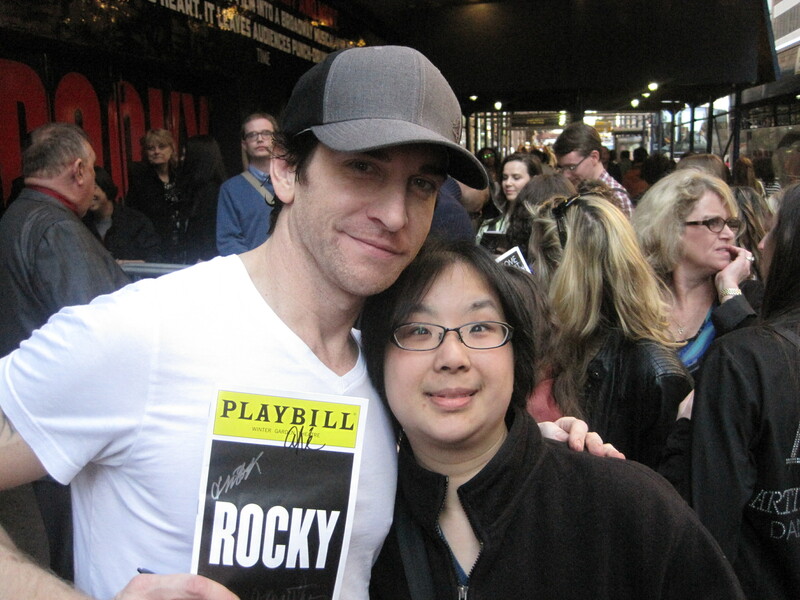 The cast was spectacular, especially Andy Karl as the titular character, expertly showcasing the charisma, the physicality and the sensitivity of the character, displaying the many facets of a complex character. I would not be surprised when he is nominated and (perhaps) wins a Tony for his outstanding performance. The stage door experience was great, per usual, with many of the cast coming out to greet those waiting, signing playbills and posing for photos – even with the intense workout that transpired on stage (fantastic fight choreography by Steven Hoggett) both Andy Karl and Terence Archie emerged from the stage door (on a two-show day) to greet and chat with those waiting at the stage door. Rocky is a classic underdog story of a “nobody” being given a chance to prove his worth to the world and to himself to become “somebody”, with a sweet love story that balances the brutality of boxing. As the show’s tag line states, “Love Wins”, and is quite the contender.